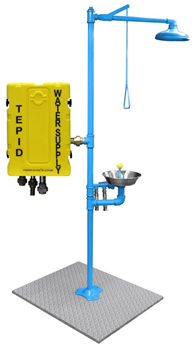 Effective Safety Showers - ThermOmegaTech, Inc.
Safety showers need to be in close proximity to plant employees and to work properly in every emergency situation. This means the shower’s water temperature needs to be tepid and consistent. When a safety shower is not working correctly, hypothermia from cold water or scalding from hot water can be worse than the initial injury that the safety shower was designed to alleviate. Issues like these are not uncommon, but they can be avoided. Here are some ways to promote plant safety. Some safety attire is not totally protective or an employee may choose not to wear it, making it more likely that an incident will occur. Showers should be placed every 100 feet within the plant, be conspicuous (in a well-lit area and identified with a sign), and be accessible within 10 seconds. The path to the shower must be free of any obstruction, making it easy for any employee to find and get to a shower quickly if an accident occurs. The first few seconds are crucial. The chemical needs to be washed off by means of a 15-minute drenching as soon as possible to minimize damage. The water temperature should be set to a comfortable range, around 85°F (27° C). OSHA regulations, by referencing ANSI standards, recommend the water be above 60° F (16° C) to avoid hypothermia and below 100°F (38° C) to minimize harm to the eyes and soft tissues. Not only does the water need to be released at this temperature, but it also must remain consistent through the use of mixing valves. Additionally, water temperature should be customized to the plant environment. For example, outdoor plants or plants in colder environments will want safety shower temperatures to be on the higher end of the 60° to 100° F (16° to 38° C) range, say 85° F or 90° F.
There are a variety of requirements a safety shower must meet in order to be OSHA/ANSI compliant. For instance, the shower head must be positioned 82 inches to 96 inches from the floor and the spray pattern must have a minimum diameter of 20 inches. The water must flow from the shower at a rate of 20 gallons per minute at 30 pounds per square inch. Lastly, the shower valves must be activated in 1 second or less and stay-open with no use of hands until the user shuts it off. Be sure the safety showers you select meet all of these requirements and test them regularly to ensure that they continue to do so. Safety showers cannot be out of commission. They need to be activated weekly to ensure proper operation and should be inspected annually to make sure they meet ANSI Z358.1 requirements. A safety inspection should consist of a tour of the facility in which a variety of safety measures are tested. Systems, including safety showers, must be on the same plane as the hazard, obstructions must be removed, equipment must be protected against freezing, broken parts must be fixed immediately; flow rates are tested, etc. Every plant has its dangers, and some are uncontrollable. However, if these best practices are adhered to, plant supervisors and managers can rest a bit easier knowing their safety showers are working correctly and, if a situation arises where the shower needs to be used, it will work effectively. This will result in a compliant and thus much safer plant. More importantly, it will result in safer employees. Nick Tallos (ntallos@thermomegatech.com) is vice president of engineering at ThermOmegaTech, Inc., which is located in Warminster, PA. Its products include mixing valves that provide tempered water for safety showers and eyewash units.